​that will be cherished for Life. This is my traditional frame. If you wish to choose a different frame, you may choose from the ones pictured below. 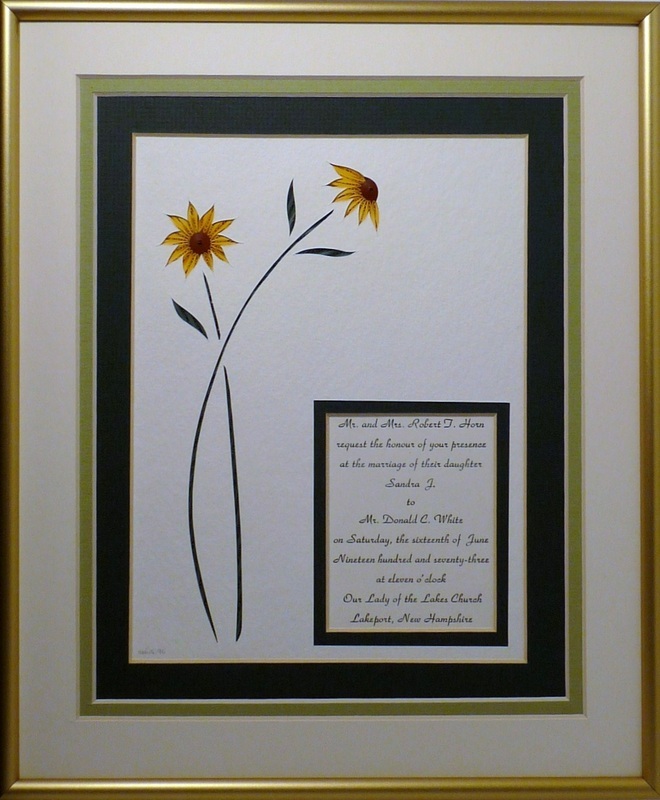 All other choices will be $25 more, as they are custom ordered, and may take additional time.​ ​You can direct me towards a design that you like in my galleries, or simply pick the color of the Daisies and I ​will take care of the rest. 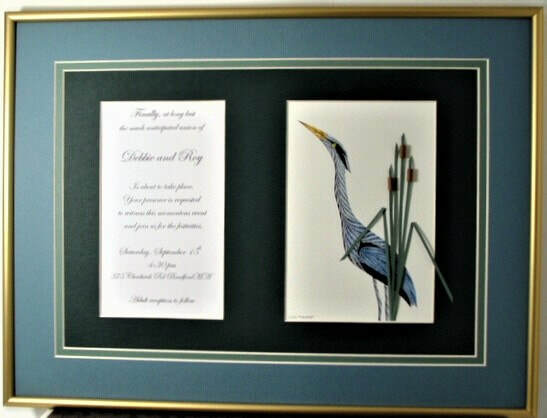 Please see other Wedding Invitation Design Galleries at the Bottom of This Page. ​It's Easy...........Pick your design or you can leave it up to me. Tell me the bride and grooms favorite color. Send me the original wedding invitation in a stiff photo mailer with payment. 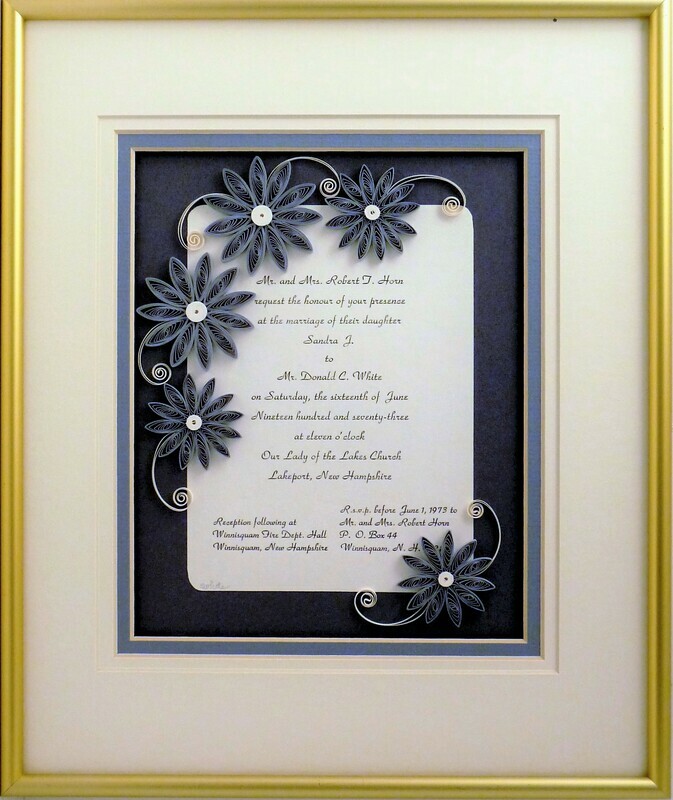 I will quill the flowers, triple mat and custom frame under glass, and ship back usually in time for the wedding, usually within 2 two to 3 weeks. This process depends on your quick response to my emails, as I will mock up the invitation and email you a photo for approval or changes. I do it your way. 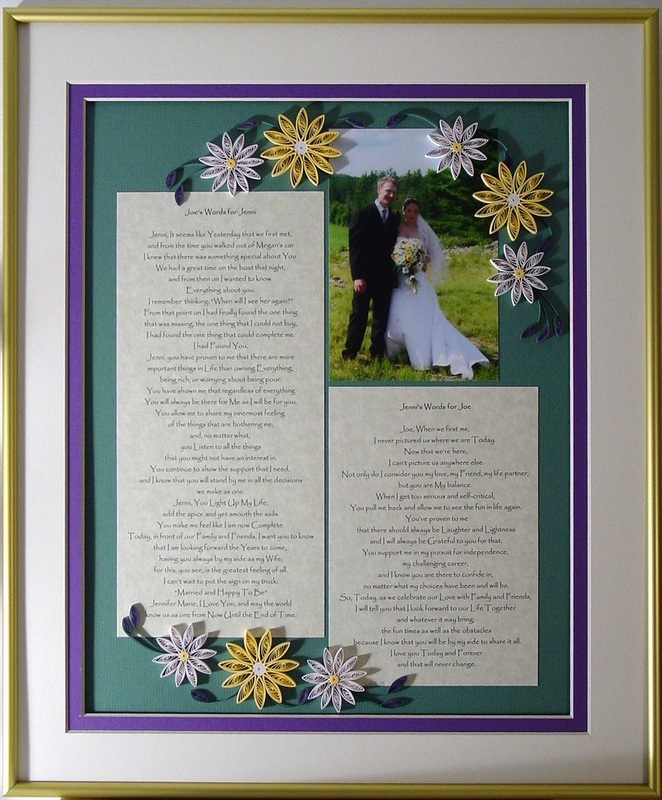 I can gift wrap free and ship directly to the bride and groom for you - just include a gift card with the invitation and your special message. For an additional $10 I can include a quilled card, just let me know what to write! My preferred payment is for you to include the check with the invitation, since you are mailing the invitation to me anyways. If you wish to pay by credit card please contact me and I will invoice you with square or you can pay with paypal below. You can then send me the invitation with color and/or design choices. 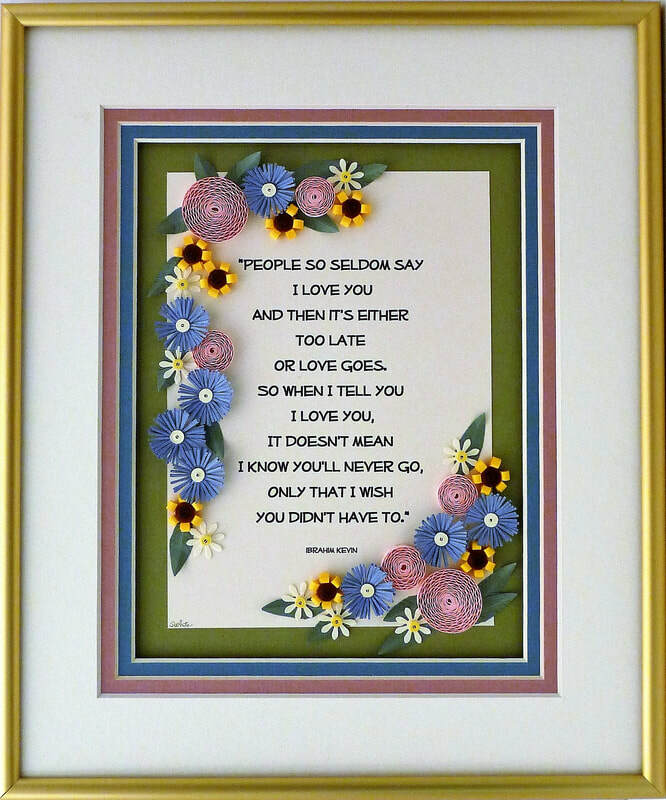 If we decide on a wood frame, I can bill for the $25 later, or you can add the $25 below. Please add $10 for shipping any size order. please see different price points below. 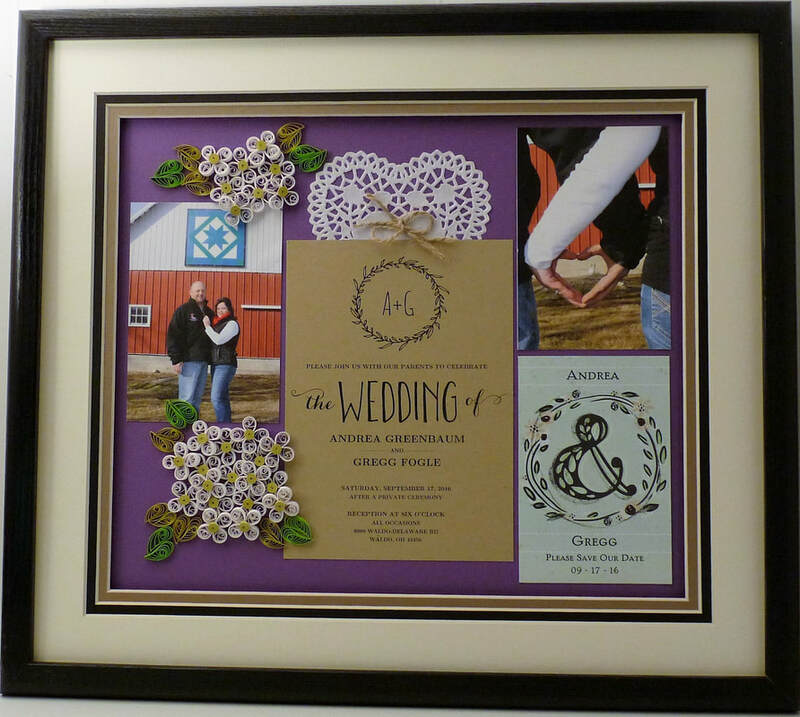 Here are my other Wedding Invitation Keepsake Designs. Let me know what you are thinking and I can design that special something just for you! 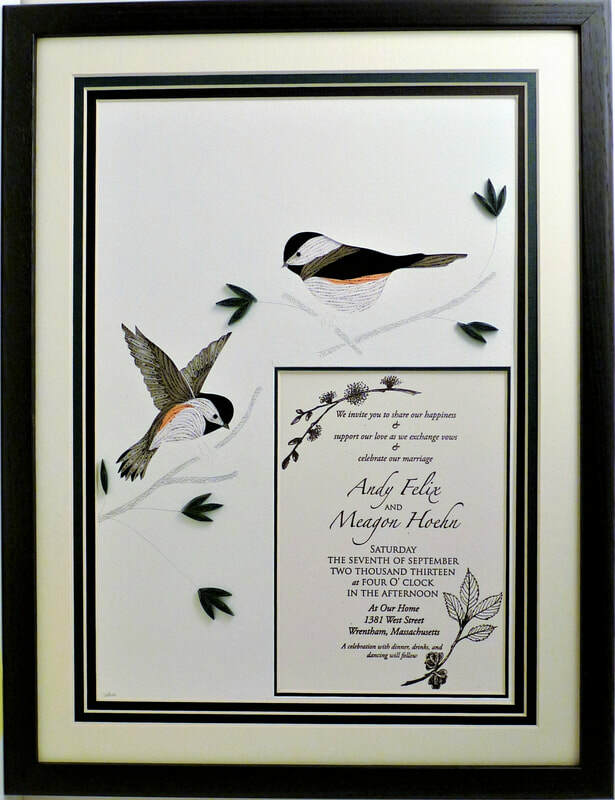 and I will combine with the wedding invitation for that perfect wedding gift.